60 Wall Street is a 55-story skyscraper (745 feet, 227 meters) in Lower Manhattan, which currently serves as the American headquarters of Deutsche Bank. Built between 1987 and 1989 as the headquarters for J.P. Morgan & Co. (now absorbed into JPMorgan Chase), the tower has over 1.7 million square feet (160,000 m²) of office space. 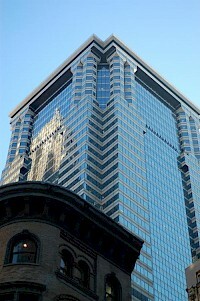 Completed in 1989, 60 Wall Street was the largest corporate building to be built in the Financial District. 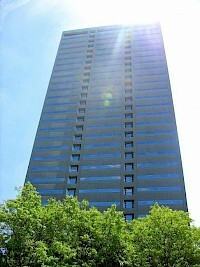 One Summit Square is the tallest office building in Fort Wayne, Indiana, United States, as well as the tallest reinforced concrete building in the state of Indiana. 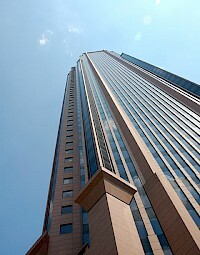 One Summit Square is a 27-story steel frame building standing at 134.7 m (442 ft). It was completed in 1982 and designed by the architects, Kevin Roche John Dinkeloo & Associates, to give the illusion of being two buildings, the adjoining tower housing the elevators.